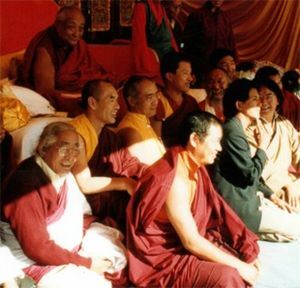 Prapoutel 1990 — During the summer of 1990, Dilgo Khyentse Rinpoche made his final, historic visit to Europe and to France. After a month at his seat in the Dordogne in southwest France, he travelled to Rigpa’s summer retreat, held that year in Prapoutel, a ski station in the French Alps. Fifteen hundred people attended this retreat, many coming specifically to meet and receive teachings from Khyentse Rinpoche. The centre of activity was a group of brilliant white tents strung along the narrow road that wound up the mountain to the ski station. The main tent, which held all fifteen hundred people, had been meticulously transformed by Sogyal Rinpoche into a temple. The central shrine was an inner tent, a pavilion made of yellow silk and lined with some of the most beautiful and precious thangkas; the shrine itself contained many of Rinpoche’s holy images and relics. This was where Khyentse Rinpoche taught for ten days, sitting on a huge, custom-built mobile throne. Next to the temple was a much smaller tent, also decorated inside with swathes of yellow silk, thangkas and exquisite Tibetan carpets. This was where Khyentse Rinpoche stayed. A garden had been created around the front of his tent, so that as he looked out at the mountains and valleys beyond, the magnificent view was framed by the sky above and green grass below. The alpine setting reminded Khyentse Rinpoche of his home in Kham, Tibet, and it so inspired him that even his health, until recently quite fragile, made a sudden improvement. Over these ten days, Khyentse Rinpoche gave some of the most important transmissions for the teachings and practices of the Nyingma and Dzogchen tradition. It was a magical time, and no-one who was there could ever forget it. When the late afternoon sunlight flooded into the temple, fusing its copper pink with the golden glow of the shrine, and as the assembly of masters and students sat at the feet of this great being, his voice ringing out, effortless, unending, majestic, it was as if time stood still. It was only too easy for those who were there to imagine they had been transported into a buddha field, and were in the presence of Guru Padmasambhava himself. Everything that happened seemed exceptionally auspicious. Nyoshul Khen Rinpoche, Chagdud Tulku Rinpoche, Khetsun Zangpo Rinpoche, Pema Wangyal Rinpoche, Dzongsar Khyentse Rinpoche and Dzigar Kongtrul Rinpoche were there, and gave extraordinary teachings. Sogyal Rinpoche was to write later: “A number of the masters present felt that through this act in the last year of his life, Dilgo Khyentse Rinpoche was placing his seal definitively on the coming of these teachings to the West, and blessing their reception with the accumulated power of lifetimes of meditation.” At the time he had said: “The real significance of this event is something we can hardly comprehend. Only in the future, over the years to come, and as its reverberations are felt, will a realization slowly dawn...”. View: The Rigpa Journal, July 2010, 'A Retreat Like No Other', pages 24-33. This page was last edited on 5 September 2010, at 13:04.